Congratulations to children from the Staple Hill area, pictured at their local library receiving medals and certificates for successfully completing the Summer Reading Challenge. Chairman of South Gloucestershire Council, Cllr Howard Gawler, was on hand to present the children with their awards. The group represents more than 7,000 children in South Gloucestershire who took part in this year’s event at libraries across the district, making it our most successful reading challenge ever. 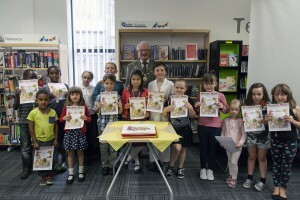 The Reading Agency’s annual Summer Reading Challenge encouraged young people to read six books or more during the holidays.